There are multiple reports that you can utilise in Messenger Payments. All reports can be exported in different formats including as a CSV or PDF file. a. From your Tiles (Homepage) in Messenger, click on Reports from the Messenger Payments tile. b. If you are already in Messenger Payments, click Menu from the top of the page, then click School Reports. 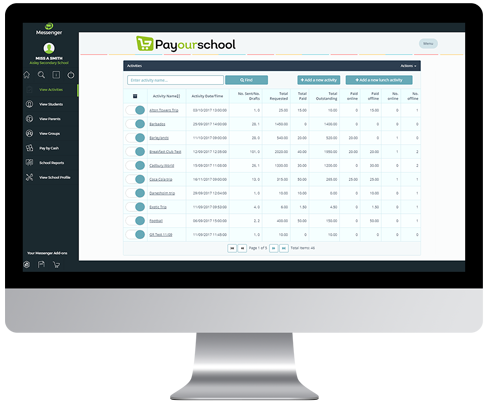 The Payments Detailed report provides a comprehensive list of all payments made to your school. By default, the date range will display all (if any) payments for today. However, you can widen the date range fields to update the list of results. 1) Choose the relevant start and end dates from the top two calendar drop down menus at the top of the report. 2) Use the on_off dropdown filter to choose whether to include online or offline payments in this report. Both types are displayed by default. 3) From the Choose Activity dropdown, you can choose to only view certain activities in the report. a. All activities will be selected by default, so just untick activities you don’t want to see in this report. 4) Once you have updated all filters, click View Report from the top right corner. You will need to click View Report every time you update any of the filters. 1) Once your report has been generated, you can use the Find function to search for specific information on the page. This function works similarly to Find functionality used in Word or your internet browser. 2) Enter text into the Find field and click Find, then click Next for any subsequent matches. Any matches will be highlighted in the report. 1) To export the selected report in your chosen format (xml, csv, pdf, metal, excel, tiff, word), click the Save As icon. 2) From the list of options, choose the format you wish to download this report as. 1) Click the Refresh icon (located next to the Save As icon) to refresh the search criteria. The Payments by Student report gives you the ability to search for payments made by an individual student within the desired date range. 2) In the text field underneath, enter the surname of the student you wish to view payments for. a. If you choose not to enter a surname, the report will return all student payments in the selected date range. 3) Then click View Report from the top right corner to generate the report. 1) Once your report has been generated, you can use the Find function to search for specific information. This function works similarly to Find functionality used in Word or your internet browser. 1) To export the selected report in your chosen format (xml, csv, pdf, metal, excel, tiff, word), click the Save As icon to open the dropdown menu. 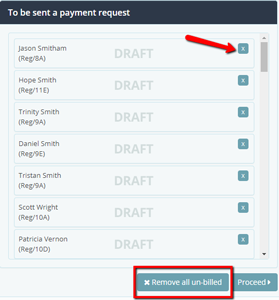 1) Once you have added recipients, they will appear listed in the third panel: To be sent a payment request. a. Remove individual students: click the remove icon next to the name of the student you wish to remove. b. Remove all students: click Remove all un-billed and all students that have just been added will be removed from the recipients list. 2) Once you have finalised your list of recipients, click Proceed from the bottom of the page. The Financial disbursements report gives you the ability to view information for money that is disbursed to your school’s bank account on a weekly basis. This report provides a breakdown of each payment in the selected settlement period, including who paid for which activity and when the payment was made. For clarification on settlement periods, and when payments will be processed and released into the school bank account, click here . 1) From the dropdown menu at the top of the page, select a settlement period. 2) Click View Report to generate the report. 3) The overview for the selected settlement period will group payments by ledger codes. 4) To view all payments made to a specific ledger code in this settlement period, click on the Description of the Ledger Code/ID. 5) Once you are viewing a list of all payments made to a specific ledger code, you will be able to see a full breakdown of each payment made, when, and how much was settled for each payment after VAT. 6) To navigate back to the overview for the settlement period (and view the amounts settled for all ledger codes, click the icon from the bar at the top of the report. You will be able to take the below actions for both the summary report (showing total payments for all ledger codes), as well as for the reports of an individual ledger code. The VAT Report will provide all the necessary information needed to aid a VAT reclaim. As there is no per-transaction charge on cash transactions, payments made by parents via cash or cheque will not be included in this report. 1) Choose the relevant start and end dates from the two calendar drop down menus at the top of the report. 3) Once the report has loaded, payments will be grouped by Description/Ledger ID. You can click on the Description (second column) to view more information for payments made to that Ledger ID/Code. Use the Disbursement Invoice report to generate invoices for a chosen billing period. 1) Click on the dropdown menu to select a billing period, then click Generate and download invoice. 2) This will download a PDF of your invoice in your internet browser. Ensure that downloads are enabled for your internet browser. 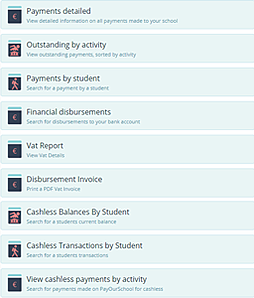 The Cashless Balances By Student report allows you to view the lunch balance for specific students or groups (e.g a Year Group or Reg Group). 1) Use the Student Last Name field to search for a specific student. 2) Alternatively, you can search for a group using the dropdown menu. By default, all groups will be selected. a. To look for specific groups, click on the dropdown menu and untick the first option (Select All). b. You can then scroll down to locate and tick the group(s) you want to view. 3) Click View Report from the top right corner. The Cashless Transactions by Student report provides information on all transactions made within your desired date range, for a student or group for cashless catering. This report will include all payments students have made for lunch as well as any top ups that parents have made. 2) Alternatively, if you want to view the transactions for a group or multiple groups, you can use the Group dropdown menu to select the groups you with to view. By default, all groups will be selected. a . Just untick the Select All option from the top of the list and then scroll down to locate the group that you do wish to view. 3) Use the calendar drop down menus to select a date range that you wish to view student transactions within. 4) Then click View Report. 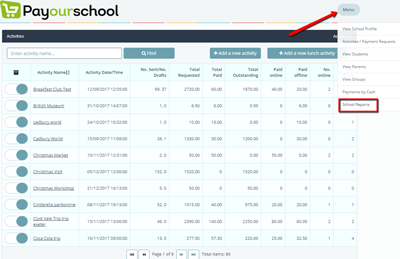 Use the View cashless payments by activity report to search for cashless (lunch) payments parents have made for any student within your selected date range. 1) To locate an individual student, click on the Student Last Name field. 2) Alternatively, to view the payments made to a group of students you can use the GroupListID field to run this report for a group or multiple groups. By default, all groups will be selected. a. Just untick the Select All option from the top of the list and then scroll down to locate the group(s) that you do wish to view. 3) Use the calendar drop down menus to select a date range.